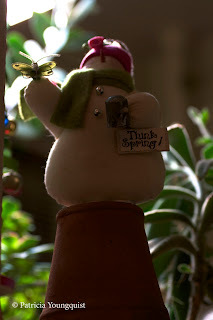 The Last Leaf Gardener: Winter Solstice: Think Spring! Today is the winter solstice — for the year 2011 — when the days stop shortening, reverse direction and begin to grow long again. I have written about this phenomenon in the past, and if you'd like to read my thoughts on the solstice for 2010 (posted on TLLG), please click here. As for the snowman figurine (seen in the image posted above), who spends the winter season in my succulent garden: He is armed with his watering can and a "Think Spring" sign — you've heard of occupy Wall Street — well my little figurine is all about "occupy gardens" in the anticipation of spring . . . for after this darkest (re sunlight) day of the year passes, each day will get brighter and brighter!